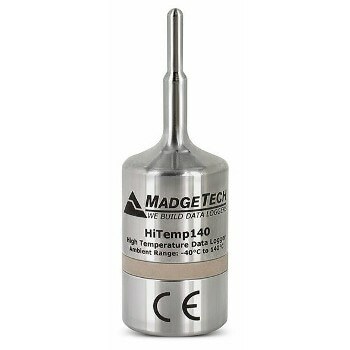 The HiTemp140 is a stainless-steel temperature data logger that has been specifically designed to be used in harsh environments, such as laboratory autoclaves. As a fully submersible unit, the HiTemp140 is capable of withstanding temperatures as high as 140 °C (284 °F), all the while maintaining an accuracy of +/-0.1 °C (0.18 °F). With the capabilities of storing as many as 32,700 readings, the HiTemp140 is also equipped with a rigid external probe that is capable of measuring extended temperatures that are as high as 260 °C (500 °F). Note that customers may request specific probe lengths that are as long as 7 inches. Additionally, the HiTemp140 also records both the date and time that is stamped onto temperature readings, all of which are stored within the logger’s non-volatile solid-state memory system, thereby allowing for any recorded data to be retained, even if the battery becomes discharged. The HiTemp140 logger can be operated through the use of the MadgeTech Software which allows the user to easily start, stop and download data in a simple manner. Additionally, this software also provides graphical, tabular and summary data in °C, °F, K or °R, depending upon the user’s specific needs. All data acquired by the HiTemp140 can aso be automatically exported to Excel® for further calculations. HiTemp140 Models: 1", 2", 5.25" & 7"